Does this Lettuce Taste Fishy to You? If so, you may have just tasted some lettuce grown with a new type of fertilizer – recycled fish poop. A graduate student at the SUNY ESF is conducting a first-of-its kind experiment in urban food production, using dried food waste to raise fish and using the fish waste to nourish an ever-growing crop of Boston Bibb lettuce. 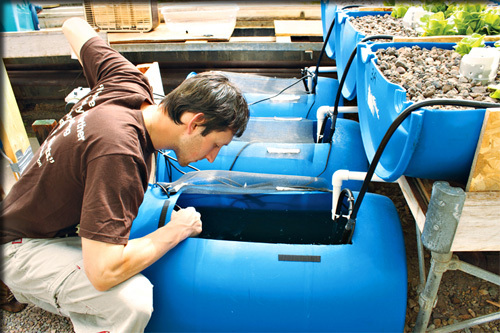 Amadori’s experiment uses aquaponics – a practice that combines traditional aquaculture (the raising of fish) with hydroponics (growing vegetables without soil). The practice itself is not new, but the part about using post-consumer food waste to feed the fish is new. What exactly is “post-consumer food waste”? It’s the food leftover at the end of the day, or the food left on the plates of students, at a Syracuse University dining hall. The food is ground up, dried and pressed into pellets, which are then fed to the fish. Tilapia, apparently, will eat anything. I wonder if that includes those god-awful ham steaks they used to serve us at Siena. Six 55-gallon plastic barrels serve as tanks that each hold 20 young tilapia. In the beginning, all 120 of Amadori’s fish together weighed less than a pound. When his experiment is complete a year from now, he expects they’ll weigh approximately one pound each. Fish in three of the tanks are fed the homemade pellets. The fish in the other three barrels eat commercial fish food so Amadori can compare the differences between the two populations. The fish tank water is pumped up and distributed onto the gravel planting bed. The gravel contains bacteria that convert the fish waste into plant food, which is removed by the plants. The water returns to the fish tank clean. ESF grad student Michael Amadori watches over his fish tanks. Temperature-controlled water from the fish tanks is pumped into plastic containers in which rows of Boston Bibb lettuce grow in beds of gravel. There is no soil. Amadori said he is using tilapia because they are hardy enough to withstand changes in pH and temperature and because the mild-tasting fish are delicious have emerged as a popular restaurant menu item in the last few years. I think the question on everyone’s mind at this point is: “What about the lettuce?” According to Amadori, the lettuce is thriving – he harvests approximately 18 heads per week. And, he says it’s delicious – just like lettuce you buy at the grocery store. Neat little experiment. One which I will leave to the likes of Amadori, because while dead fish can be delicious, live fish is nothing more than a cold, slimy mess. Thanks to Shannon for the tip on this story from the proud State University of New York system!